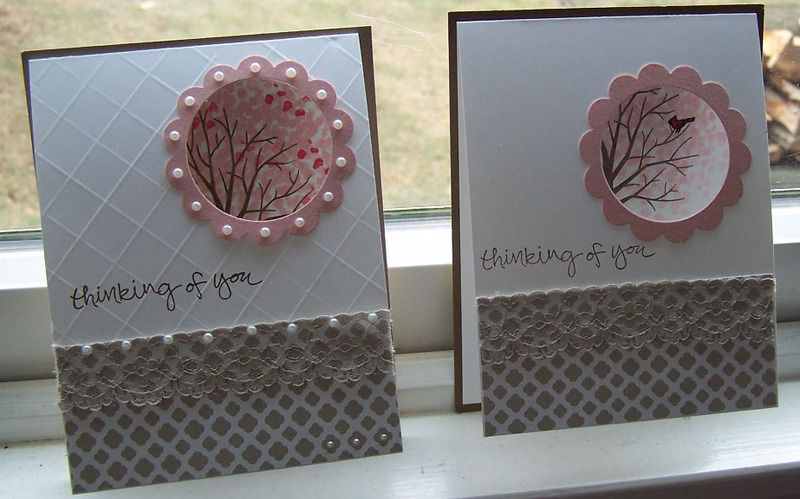 My last post was a card that I made for with my Stamper’s Club group using the Sheltering Tree stamp set. 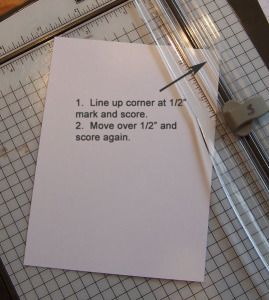 As I was writing up the information for the card, I started to think about how I could Step-up the card with some embellishments and a little scoring to make an embossed card front. 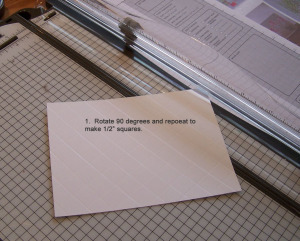 Here are the details on how to make the embossed squares on the card front. 1. Start with the cardstock at an angle on your cutter and the end at 1/2″ and score. NOTE: Make sure that you push your cutting blade to the end of the cutter so you don’t accidently cut instead of score. 2. Move the cardstock over 1/2″ and score again. Repeat across the whole side. 3. Rotate and repeat going the opposite way. To Step-up this card, I added pearl jewels around the scallops on the edge of the window and along the lace. I aslo added three pearls along the bottom right corner of the card. So which card do you like best? I like your embossed card better, but I think it is a little busy. I don’t think that you need the pearl embellishments on the scalloped window. I like the 3 small pearls on the bottom right. It complements the composition of the card nicely. Thanks for your feedback! I hope that you can make it to one of my classes again soon!